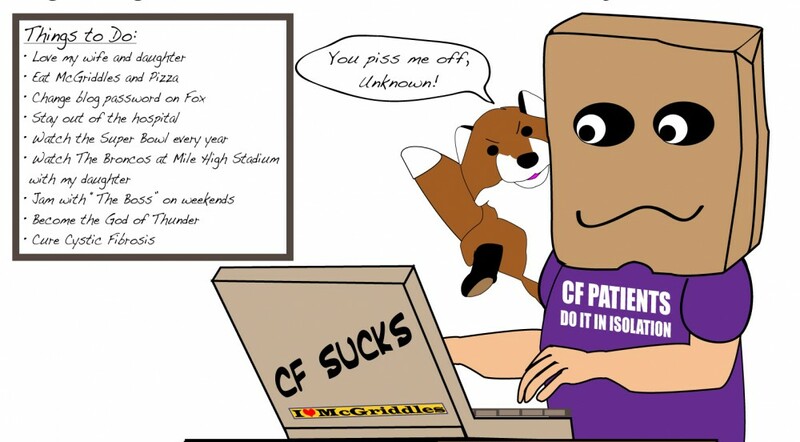 This entry was posted in cystic fibrosis and tagged cystic fibrosis, luck, oxygen by unknowncystic. Bookmark the permalink. It’s so good to see you posting again but sorry that it came out as a mix of the good and bad. I was wishing it would only be the good. Knew that you had mentioned an earlier hospital stay but had no idea it was that serious. But then again, any hospital stay is serious. Glad that you recovered and had a fantastic vacation, I’ve been thinking about how nice it would probably be to visit Vancouver Island. Might have to make it out that way and see sometime in the future. Again, glad to see you posting again and thanks for the update. Keep milking it and wishing you many more magical times. Thanks for first to comment on this post, a first after a long absence. You would love Vancouver Island. Camping galore. However, now that I think of it, you live in a place with forests. No need to go there. Unless you want the great food and amazing ocean views. Never knew there were some many smaller islands there. Hey Hollywood! I too, have been raised from the dead. I received new lungs on January 1 and then headed directly to ECMO, and then trached on my 40th birthday, January 18 until May 8. I finally got paroled on May 26 and I’ve been slowly learning to walk again. It’s tough, but I have new lungs with no rejection. Still waiting for the big huge breath (up to 58% right now) but I’m planning my exotic vacation for the end of November when I’ll have what you had in Vancouver. I can’t wait. I hope your summer slows down. Mine is going too fast. The twins start seventh grade in 2 weeks. I’m just glad I’m here to see it. Thrilled you replied. Thrilled you have new lungs. Not thrilled about ECMO. But I’m glad you’re still in the game and still there for your kids. I’m truly glad you get to see them enter 7th grade. Mine is going into high school and I never thought I’d live to see her do it. My goal is to see her graduate from high school. Can’t wait to hear where you’re going on vacation. Not sure Vancouver Island is the place to go in November. A bit cold for my taste. What happened that you had to go on ECMO? I don’t remember the ECMO, I don’t remember the first half of January. I was on ECMO directly after the surgery. My lungs were too “wet” to work. They had to dry out I guess. The two lower lobes on each side were collapsed and infected from the get go. I had one surgery in February to open the right side and one in March to open the left. I had more blood transfusions than I can count and about 10 surgeries later, I was done with surgeries and then my body had to recover from all the trauma. I had major PTSD anxiety for a lot of my hospital stay. After ECMO for 10 days I was placed on the ventilator and that didn’t come off until May 8. It was a really long winter. That’s why we’re going to Hawaii in November! We’re staying on O’ahu and I’m in charge of the planning. There’s a group of about 15 going with our family. It’s going to be fun. Oh, my gosh. Words escape me. I can’t believe you went through all of that. Unreal. I am thrilled you are going to Hawaii in November. I would live there if I could. Have a great time. Thanks for staying in touch with me and letting me know what has been going on with you and the kids. I’ll wishing great things for you every day. You must stick around a lot longer than hs graduation – who else is going to bug your daughter as good as you? Here's to many more miraculous family vacations TOGETHER. I hope so, but I’m not taking it for granted. Each year gets tougher and the hospital stays harder to overcome. I hope so too – wishing you all the best. Hey! It’s so good to hear from you! I’m so sorry for the rough new year but glad to hear you got off the O2 full time and were able to enjoy your vacation. What a miracle. I’d love to know more about the Aerobika. Best to you and the family. Like the Facebook updates. I love my Aerobika! I’m so glad you had success with it. Three hours a day it a lot of airway clearance. You’re hard work paid off! I’m so glad you recovered and were able to enjoy vacation. I’m on my 12th week of IV’s, but I’ve done them all from home. I’ll find out this week how much longer. It’s annoying. The Aerobika is awesome. I used to use the Flutter, but that was twice the work. 12th week of IVs? argh. At least you’ve been home (small consolation but it’s better exercise, as I hibernate in the hospital). Hope you find out you’re done with them. Thanks for the note. Good to hear from you. When the cold dark fingers of CF wrap themselves around you they don’t like letting go to easily!! Pleased to see that you managed to escape them and have a brilliant time on Vancouver Island and to be able to fly as well must be a bonus? Girls both doing really well at the moment, Robyn has now moved over to the adult CF team, which makes me feel even more older.